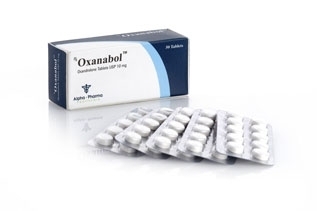 Oxanabol Alpha Pharma is an anabolic steroid with exclusively low androgenic activity and very high anabolic index. It is very popular in bodybuilding as one of the best anabolic steroids for the cycles of weight loss and drying. Also it is known under the trade mark of Anavar. Oxanabol was created in 1964 and initially used for weakened persons, for anemia treatment, for bone fortification, at Terner syndrome and also for restoration after singes. Oxanabol – one of few anabolic preparations successfully used in female bodybuilding. The preparation has a very high anabolic index. Its anabolic activity has up to 400% of testosterone while the androgenic component is of 25%. Oxanabol is not converted to estrogen and that is why doesn’t require addition of such preparations as Proviron or Tamoxifen to the course. Preparation is alkylated by 17-alpha and this makes it possible to pass through the liver without being destroyed but has a weak toxic action. Anavar is available exclusively in the form of tablets. The half-life of the preparation in blood is 8-12 hours; detection time is up to 1.5 month.